Every year when my children ask me what I would like for Mother’s Day, like most moms, I tell them not to spend their hard-earned money on me. But of course, they do anyway. So after four decades of having my input ignored, I’ve finally come to the conclusion that you might as well give your loved ones a Mother’s Day gift wish list, so you get one that will tickle you pink. Let’s face it, Mother’s Day comes just once a year, why not let them pamper us a bit? Here are a dozen gift ideas, any one of which would please me, and perhaps your mother, too. Remember all those mornings when you woke up to the yummy smell of pancakes? Moms hit the ground running most days, preparing breakfast, packing lunches, and juggling several other chores in between. Tell her to sleep in (until at least 10) and have coffee and a hearty pancake breakfast ready for her. The Vermont Country Store’s all-natural pancake mixes make it easy to whip up a batch of gourmet johnnycakes, in 8 delicious flavors: just add 1 egg and water! Before serving them, be sure you slather on the butter and drench the stack with golden, amber, or dark 100% pure Vermont maple syrup, the best in the world. Warmer weather has arrived, so I’ve stored my wool sweaters safely in the cedar chest. 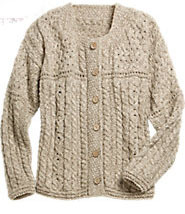 But there will be plenty of chilly mornings and evenings when a lighter-weight classic sweater is necessary. This one, in a cotton-linen blend, is quite lovely and versatile; I would wear it with dresses, slacks, and jeans. Made in Ireland, it’s an authentic traditional Aran design. While visiting Ireland a few years back, I learned that each type of sweater stitch symbolizes something. With its patchwork of cable and lattice stitches, this sweater symbolizes good luck and a plentiful catch of fish – good charms to have along, even if you aren’t fishing! A beautiful nightgown is an extra-special gift. It’s not necessarily romantic, though it can be. Like most women, I like sleepwear that’s embellished with feminine details, but styled practically. Eileen West is famous for pretty little touches, and with its abundance of pintucking and lace, this gown is true to her legacy. The cut is generous, so it won’t cling to or confine the body. And because it is sleeveless and the fabric is breathable cotton lawn, it will be especially comfortable during hot, muggy summer months. Pretty? Yes. Old-fashioned? Perhaps. Practical? Absolutely! These pure cotton hankies are bordered with tiny hearts and pastel florals, Lanz of Salzburg’s famous Tyrolean print, so unlike embroidered hankies, they won’t pucker in the wash and they iron up quick and easy. (Yes, I iron my hankies!) The set of 12 includes 6 pink and 6 blue — plenty for purse, gym bag, and backpack. Nearing my sixth decade, I’m keenly aware of skin changes, especially on my face. Hindsight is 20/20, but I do wish I had taken better care to protect and nourish my skin from environmental damage when I was younger. Thankfully, there are breakthrough products like Red Wine Resveratrol Eye Cream. This ultra-hydrating cream feeds tired complexions a blend of antioxidants, vitamins, and nutrients, including resveratrol found in red wine grapes, to keep skin looking more youthful, vibrant and healthy. This highly concentrated formula contains as much resveratrol as 30,000 glasses of wine. Cheers, my skin will drink to that! It’s next to impossible to find a good-looking tablecloth that will last a lifetime, but these do. A rich history is woven into each piece; you can see it in the traditional weave and feel it in the hefty fabric. They cost a bit more than most other tablecloths on the market, but they’ll last a lot longer, becoming a treasured heirloom. That said, there’s no need to hide Mountain Weave table linens away until a special occasion; use them every day for every meal. Due to the nature of the weave, if there’s an unsightly spill, simply flip it over and use the reverse side. The frosting on the cake: from cotton to weaving to hand-finishing, they are made entirely in the USA. Last year my sister-in-law gave me the gift of a professional foot massage, my first ever. If you’ve ever had a foot massage, you know how utterly relaxing and reinvigorating it can be, but like all spa treatments, they can be pricey. The Vermont Country Store’s therapeutic foot massager provides the same effect plus reduced pain and improved circulation, in the comfort of home, while you knit, read a book, or watch a favorite television show! The 12-speed massager simulates the skilled hands of a reflexologist. Now that’s a luxurious gift! Like many other women, I love fragranced soaps and I always find my way to them in a store. Obviously, part of their lore is the fragrance, but less apparent are the memories of scents and sudsy moments each bar evokes. Of all the soaps I’ve used, The Vermont Country Store triple-milled soaps are some of the best, and they are made right here in Vermont. From an all-vegetable base they deliver a fragrance that is never overpowering, plus an abundance of creamy lather right down to the tiniest sliver. I’m wishing for the set-of-6 sampler which includes one Citrus Deodorant, Oatmeal and Almond, Lemon Verbena, English Lavender, Sandalwood, and Rose. Grandma had one. So did my parents. I remember running my hand over the fluffy chenille tufts, reveling in their cool softness. 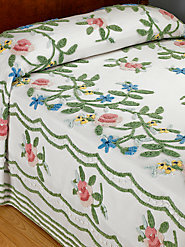 The Rosalee floral chenille bedspread is a replica of the vintage style so many of us grew up with. Bright and cheerful, it’s made in pure cotton for year-round comfort. I know my sweet dreams will be infused with fond childhood memories…. Better than Merrimints! The Vermont Country Store had a candy maker re-create these melt-in-your-mouth mints with the same crystal-to-creamy, melt-in-your-mouth texture and decorative ridges on one side that you remember. Even if your mom usually doesn’t eat candy, she’ll love these, half-dipped in rich, dark chocolate – a small sweet treat that’s perfect after lunch or dinner. The one pound box includes peppermint, wintergreen, lemon, and spearmint. If one of my children brings a hummingbird cake, I’ll make a fresh pot of coffee and we’ll all sit down and enjoy a piece, right there and then! 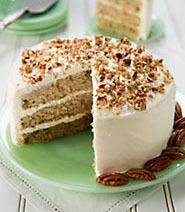 Hummingbird cake is the most requested cake recipe in Southern Living Magazine’s history. The Vermont Country Store’s is made to triple-layer perfection in Savannah, Georgia at a local confectionary; it’s chock-full of bananas, pineapple, raisins, and pecans, and slathered with rich cream cheese icing. The result: an irresistibly moist layer cake that treats you to a savory blend of sweet, spice, and tanginess with every mouthful. At 7″ diameter, it weighs in at a hefty 55 ounces and is delivered guaranteed fresh. The Vermont Country Store has hundreds of other unique, hard-to-find and practical Mother’s Day gifts. Still not sure what to get Mom? 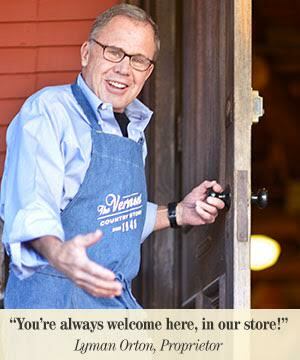 The Vermont Country Store Gift Card will tickle her pink!